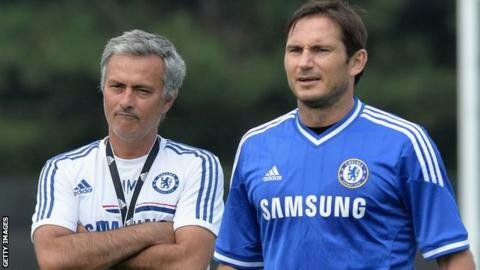 Derby manager Frank Lampard "does not believe" spying tactics were employed during his time as a Chelsea player. The Football Association is investigating Leeds head coach Marcelo Bielsa, who admitted sending a member of staff to 'spy' on Derby training. Ex-Blues coach Andre Villas-Boas reportedly said he would secretly watch opposition train during his time at Stamford Bridge under Jose Mourinho. "I certainly wasn't aware of it and I don't believe it at all," said Lampard. "Certainly not in the form that it happened this time." Villas-Boas, who was a coach under Mourinho at Porto and Chelsea and then managed the Premier League club between June 2011 and March 2012, was quoted in a Telegraph article in 2011 saying he would "travel to training grounds, often incognito" to pick up information on opponents as Mourinho would "leave nothing to chance". Leeds have formally apologised to Derby and reminded Bielsa "of the integrity and honesty" of the club after he took responsibility for a Leeds staff member seen acting suspiciously outside County's training ground last week before their Championship meeting. Lampard described the incident as "bad" and said it had "disrupted" his side's build-up to the match, which Leeds won 2-0. Bielsa said he had used the practice during his time in charge of Argentina, but Lampard does not see a place for it in the modern game. "Amongst managers - and I haven't canvassed opinion - but going on my time at Chelsea and my year at Manchester City and seeing how protective top managers are over their work, I would expect them to be of the same thinking as myself," said Lampard. "Pundits or ex-players who say 'well it always used to happen 20 years ago' - well, it's not 20 years ago, it's the modern day." Lampard, who won three Premier League titles and the Champions League during a 13-year spell at Chelsea, is now looking to move on from the incident. "It is now a conversation between the FA and EFL (English Football League) and for them to decide if it is worthy of a punishment," he added. "I don't think offering my opinion now on what should happen is the right thing to do. I think I made my feelings quite clear after the game. "This will be the last time I speak about it. I certainly don't want to be the person who keeps speaking about an issue when it's gone."